Just as in the workplace -- where employers today struggle to manage workers from four different generations -- in today’s church, generational differences are a major challenge, says Haydn Shaw, a business consultant and writer on generational differences. When young people 14 and under are taken into account, churches today for the first time have five generations among their members. Theologically, for example, different generations have been influenced in different ways and so bring a different understanding to Scripture, he said. The era in which we were born and raised shapes us with both spiritual strengths and spiritual weaknesses. “Generational intelligence is understanding the basic facts about different generations so you can take those into account when you plan for your church,” he said. Understanding generational differences can be particularly helpful for churches trying to figure out how to attract millennials and other young people. It can help churches learn how to ask better questions, he said. He spoke recently with Faith & Leadership. The following is an edited transcript. 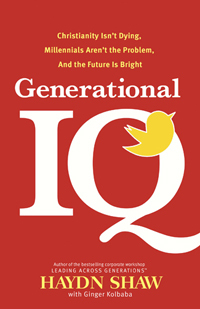 Q: Before we talk about your new book, “Generational IQ,” tell us about the earlier book that it builds upon, “Sticking Points.” What was “Sticking Points” about? It was about how organizations deal with the fact that for the first time, four generations are in the workplace. It doesn’t matter what kind of organization -- a university, a business, a government agency, a church. All organizations are impacted by having four generations on staff. Or, if a nonprofit, four generations of volunteers. Q: Explain the notion of “sticking points.” What are they? Pew Research surveys have shown that people believe there are big generational differences. In fact, more people today say there are generational differences than they did in 1969 at the height of the “generation gap.” The difference is, back then, two-thirds of people thought it was creating major problems in the country, and today, only a third do. It’s not that different generations collide or crash into each other. It’s more about sticking points -- places where the generations get stuck, places where they answer the same questions differently. If we learn how to deal with those effectively, they can also be the places where the generations learn to stick together. Q: What are some of the most common generational sticking points? Feedback is another. The older generations had either formal feedback or “no news is good news.” Now, they’re managing and leading people who are used to seeing their grades and test scores on the computer screen all the time. Communication is another. Is it OK to text a message when you’re going to miss work? “I’m texting in sick” -- is that respectful? Do we wait our turn? Or do we push forward a new idea that we think would be effective, even if other people feel like we haven’t paid our dues? How long do you have to wait before you suggest new ideas or criticize the way something’s been done? Everybody wants all of those things -- work ethic, feedback, communication, respect -- but each generation defines them differently. Q: And in “Generational IQ,” you say these same kinds of generational issues are at play in church life. Yes. In the book, I suggest that generational differences are the largest challenge that churches face. We’ve simply never dealt with five generations in the church before. We’re the first generation that has to deal with it, and it is throwing off some sparks -- that’s for sure. Q: Where are the sparks coming from? Well, theologically, different generations have been influenced in different ways, and so they read Scripture with different lenses. Once you understand what the research says about the generational themes and values of each generation, then you can see how that influences what people emphasize in Scripture, and what they put into practice. Generational intelligence is understanding the basic facts about different generations so you can take those into account when you plan for your church. It’s about understanding the spiritual strengths and weaknesses of each generation, how when we were born shapes how we see God and how we relate to God. When we were born sets us up for some great spiritual strengths, and also some real spiritual vulnerabilities, or weaknesses. Understanding that allows those who teach to plan more helpful messages. And it helps churches ask better questions. When it comes to the generations, churches rarely ask helpful questions. Q: You contend in the book that generational research contains good news for the church, that “Christianity isn’t dying, millennials aren’t the problem, and the future is bright.” How so? But I think we make better responses to things when we’re more thoughtful. Secondly, when you dig into the actual numbers on the “nones,” you discover some surprising things. When we talk about a 7 percent jump since 2007 in the nones, we’re looking at a jump in people who didn’t actually attend church or weren’t active in their faith but [in the past because of the social stigma] claimed to be Christian on surveys. But many nones go to church. They don’t claim Christianity as their religious affiliation, but they attend church. As many as 2 percent attend church every week, and volunteer, and give money; they just don’t want to be labeled. Others attend church on Christmas and Easter and other times, so they’re not opposed to church. They would call a church if they were hospitalized. They see that as their church. They just don’t want the label. The millennials really are less churched and are slightly less believing in God. But the percentage of people in the United States who believe in God has dropped 2 percent since the 1940s. It’s dropped just a little under 10 percent since 2007 for the millennials. So yes, there has been a drop in faith in God. And there has been a change in how people define and conceive God. But that is a far cry from saying that churches are dying. Churches were never as big -- Christians were never as big -- as we thought. So the drop is not nearly as big as we thought. Q: Give us some examples of how generations differ. Let’s just take the four generations that you’ve got traditionally. Generally, traditionalists were born before 1945, so they’re 70 and above. And then you’ve got baby boomers, 1946 through ’64, and then the Xers, born ’65 through 1980. And then the millennials, 1981 through 2000. And then there’s another generation, probably around 14 and younger, that no one’s agreed on the name. So we’ve got five generations in the church for the first time! Traditionalists were shaped by the Great Depression, and World War II, and sacrifice, and everyone working together, and so they had some really great strengths. Traditionalists are the givers in the church; 70 percent of the money still comes from people who are over 70 in many churches. We literally have two new life stages: a longer emerging adulthood for the 20-somethings and one for folks that retire. These are uncharted areas for both groups, and they pose new challenges for the church. The boomers also have some great strengths. They brought God close. Doctrine was a major focus of the traditionalists, but today, in many denominations and religious traditions, it’s much more focused on an expansive God, a relationship with God, being close to God. At the same time, the boomers can take that too far in being hyperindividualistic, evaluating everything by whether or not it makes me happy or meets my needs. It’s more of a consumer mindset. Look at the way people church-hop today. It’s not that people didn’t switch churches before. But in the past if people left a church, it would have to be for a pretty big reason; it would be after they got pretty mad. Baby boomers wouldn’t church-hop because they were mad but because they thought something was better someplace else. Q: What about the millennials? What’s your take on them? The millennials have brought a focus on authenticity, which is great, because it is possible for churches to be too polished and to not feel authentic. Millennials also tend to be tribal. We’ve all seen them in their natural habitat, a restaurant where 20 of them spread out at five tables talking to people at their tables while texting people who aren’t there. Millennials think that the traditionalists -- their grandparents -- are the greatest generation, and they think the Xers are a little whiny. The millennials want to be mentored, both at work and at church, and that is a huge opportunity. Most churches don’t know what to do with 20-somethings. They are the most underserved group in almost every church. It is probably the most complex part of the church to minister to. These 20-somethings -- emerging adults -- are characterized by change and exploration, and not settling down. By moving around, and switching roommates, and sometimes switching lovers. And churches do best with stability. But the research shows that if we take an older adult and we match them up with a person 18 to 23 and they just text them every other week, keep some kind of connection with them, the likelihood they will drop out of church is cut in half. It can’t be their parents; it has to be some other adult in that church or congregation who cares about them and is willing to stay in contact with them. Q: So what should churches do? What’s the best way to reach millennials? The best way to go about it is to ask a different question, ask a better question. “Why won’t they come to us?” is a dead-end question. It either makes us feel bad or puts them down and makes them the problem. It’s more effective to ask what we have to do differently so that they would find us a place of spiritual health and help. If we’re going to reach other people not like us, we’re probably going to have to do it a little differently. And I think asking those questions is more effective. But the No. 1 thing we can do to reach the millennials is to understand this new life stage of emerging adulthood. If we don’t get a little more generational intelligence, we will focus on the wrong things, and get upset about small things, and propose things that aren’t going to help. They’ve still got another 10 to 20 years’ worth of life, and nobody wants to be put out to pasture for 10 or 20 years. So what are we going to do after we make the changes to reach the younger generation? One of the beautiful things about the millennials is that they really want to know what older generations think, and how they’ve sorted things through. So this is a match made in heaven. You’ve got older people who are living longer and want to know how to make an impact on their retirement. You’ve got younger people who are wanting somebody in addition to their parents that they can go to, and think out loud with, and sort through all the new choices that previous generations didn’t have and didn’t have to make. That’s the second point I want to make about reaching the millennials: we’ve got a match made in heaven here between them and older people who are looking for something more than just folding bulletins or singing in the choir in their retirement. The field is ripe to harvest.